The Nokia Lumia 800 is without a doubt one of the most interesting devices produced by the iconic Finnish smartphone manufacturer in a long while. Expectations are high for the Lumia series, which represents Nokia’s first foray into devices running Windows Phone 7.5. At the same time, we haven’t touched many Windows Phones since our initial review what seems like ages ago, but the platform has moved along, giving us an opportunity to finally take a formal look at the new things Windows Phone 7.5 brings. It’s easiest to just start with the aesthetics, and here the Lumia 800 shows a huge amount of influence from the Nokia N9. Though we don’t have an N9, it’s comparatively easy to confuse the two based on just how similar their exteriors are, though inside both are completely different beasts. 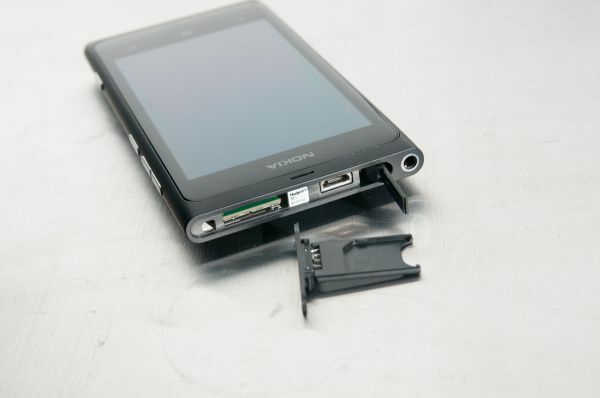 Of course, this form factor borrows a lot from what made the Nokia N8 such a unique device - unibody design, rounded edges, tapers, and a flat top and bottom. The only downside to this unibody construction is having the battery sealed inside, which isn’t quite a deal breaker but is worth noting. 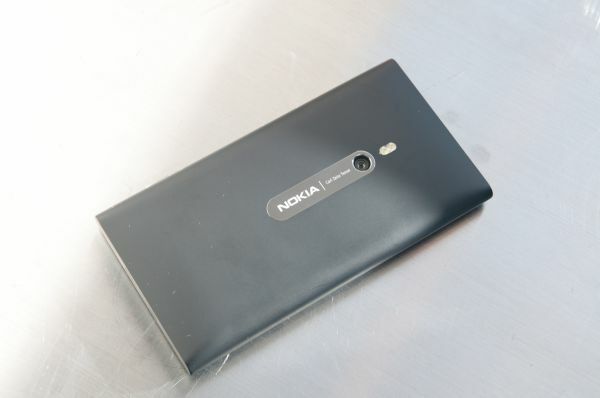 The Lumia 800 (and N9) physically depart from the previous generation of Nokia designs in a major way by eschewing anodized aluminum in favor of a monobody polycarbonate plastic exterior. Of course, this led to much gnashing of teeth over whether the Lumia 800 would feel plasticky, and many looking at this change in materials as a step backwards. Unsurprisingly, the handset doesn’t feel cheap or plasticky at all. I’ve seen Nokia refer to the exterior as polymer a few times (much the same way some weapon manufacturers refer to things as polymer in place of “plastic”) and honestly after playing with and holding the Lumia for so long I’m convinced the phone pulls this material swap off quite well. The only downside is that skin oil does discolor the plastic visibly (at least the black variant we have), but it isn’t anything a wipe with a microfiber cloth can’t fix. Part of what really helps the Lumia feel good is the fact that the exterior isn’t glossy or mirror-smooth, but rather given a light matte texture. It doesn’t scuff with a fingernail either like some other matte-finished plastics. In addition, it’s striking how nice having a uniform round edge at the left and right side helps ergonomics. It really is one solid piece, minus the display glass. 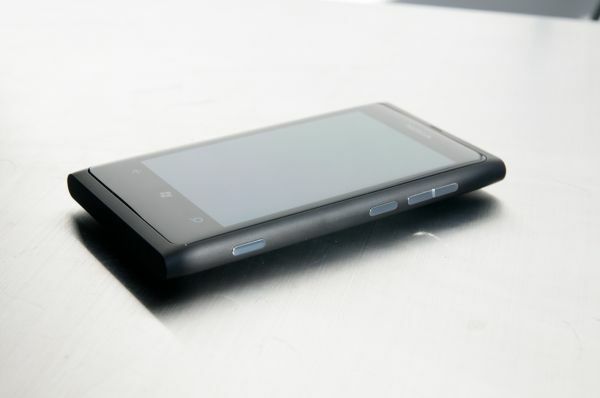 The only completely flat parts on the Lumia 800 are the top and bottom, with the rest of the phone having a convex spherical shape. On the backside, the only part of the phone that is indeed flat (and thus sits coplanar with a surface) is the chrome “Nokia / Carl Zeiss Tessar” strip which houses the camera. The only major annoyance I have with the whole design is that putting chrome right where the device lays flat just invites scratches. Even with a case on, the chrome strip has picked up some scratches that definitely show at the right angle. To the right of this strip is a dual LED flash, and a tiny little cutout home to a second microphone undoubtably for noise cancelation when on calls. At the very top is the standard headphone jack at far left, and the two doors for both microUSB and microSIM. The microUSB door has a raised region to demark where to press, and pushing here pops up the door which is held shut with magnets otherwise. I worry this door is the first thing that will break off, but it’s nice having a covered port. Right next to that is the microSIM tray, which slides over and then out. The door has some contacts on it that seem to be used with logic to tell when you’ve ejected the SIM as well. It’s also inside here that Nokia places the model number, FCC ID, and all that jazz. It’s with these two open that you can see the only two screws on the device as well, which look like some Torx bits. It’s intriguing to me that we’re now seeing microSIMs popping up everywhere and in so many devices. While this used to be a big deal, SIM cutters are now so ubiquitous that it’s impossible to fault anyone for using one. On the right side, Nokia puts the volume rocker above the power button, and then on the lower quarter is the mandatory two-step camera button. I have no complaints with any of the buttons; obviously, Nokia has this down and I have no doubt they’re communicative enough to use even with gloves on. 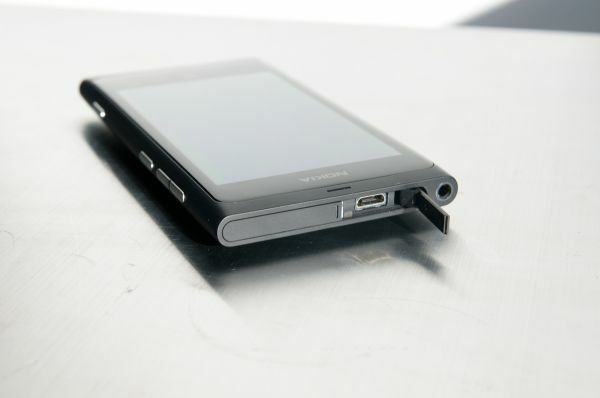 The bottom of the Lumia 800 is home to some more European regulatory markings, and the speaker grille which hides the speakerphone and microphone. More on this later, but I unfortunately found the Lumia 800’s speakerphone incredibly quiet. The left side is devoid of buttons, and really feels good. When I look at the ports arranged this way, I feel that they’re designed to accommodate the phone being held in the left hand, with the fingers naturally resting right on the buttons. The front is one homogenous piece of glass with the three mandatory Windows Phone buttons at the bottom, all capacitive and backlit. I have no complaints with the capacitive buttons - they work perfectly. 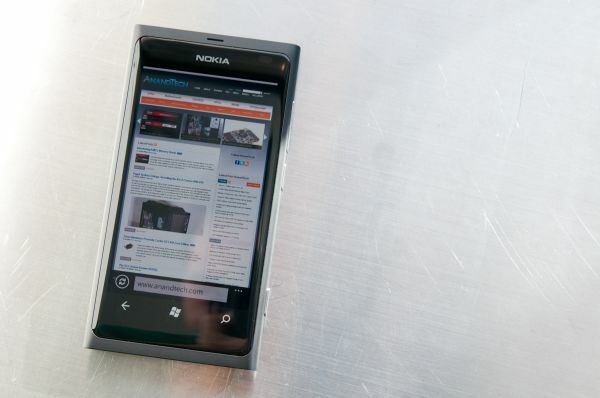 Curved displays are all the rage lately, and again the Lumia 800 has a convex shape that bows outwards spherically, including the front glass. It isn’t huge, but it’s enough to be perceptible. Up at the very top is the narrow slit for the earpiece. 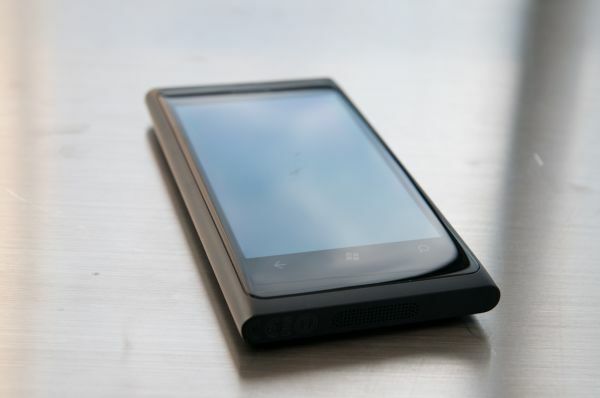 Nokia also does something interesting and ships a rubberized exterior skin with the Lumia 800 right in the box. This is a welcome thing to do that I wish more smartphone OEMs would do. The rubberized skin doesn’t cover any of the buttons or ports and keeps the backside off rough surfaces to prevent scratching. I spent most of my time with the Lumia 800 in the rubberized case, but more because I worry about shipping devices back all scuffed up than out of worry about build quality. I think that’s the major takeaway in the look and feel department. Though we haven’t reviewed every Windows Phone formally, I’ve at least touched every one of them, and the Lumia 800 is without a doubt the absolute best Windows Phone hardware out there right now. Build quality is excellent, the phone feels substantial in the hand, and the form factor and shape have a spark of - something different - people were looking for when they thought about Nokia making a Windows Phone.